The Genipak is a cheat device for the Sega Mega Drive, released by Taiwanese company Realtec in 1992. 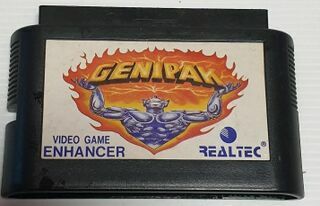 Little is understood about the Genipak - its cartridge design means it only functions with Japanese or Asian systems, and despite possible first impressions, the codes use a different format to those of the Game Genie or Action Replay. The Genipak originally shipped with a code book compiled by Realtec, but its limited production run makes it extremely rare and very little of its contents have been listed on the internet. As such, the cartridge is currently useless on its own.